Hamilton's 14/0 sized movements were purposely designed in the mid 1930's for long and thin models. Some models like the Carlisle and the Dickens are so long they are curved to fit your wrist. Other models were more rectangular and there are a lot of very similar models in case materials ranging from 10K gold filled all the way through platinum. There are several solid 14K gold models that easily confused, including the Wesley, Barton, Gilbert and the Keith. The Keith was introduced in 1950 and produced for only three years. Although the cases of these models are very similar, they are differentiated by their dial patterns. Some models have all-numeral dials and others have numerals and different types of markers. Some models have two tone dials and others are basic silver butler finish. 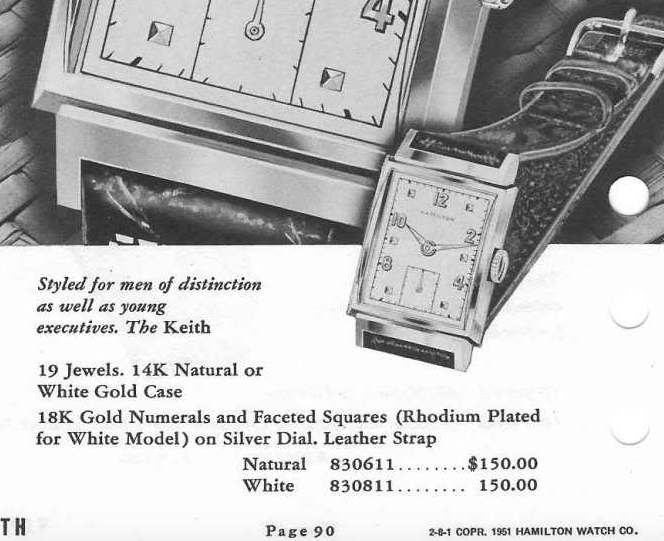 The Keith has a silver butler finished dial with solid 18K gold numerals and square-shaped markers. Being a solid gold model, the Keith has a 19 jewel 982M movement. The M is for medallion and the 982M was used in the solid gold models starting in 1940. The 19 jewel 982 movement was used in 14K gold filled models and the 17 jewel 980 was in the 10K gold filled models. Prior to 1940 you'd find the 982 in solid gold models and the 980 in gold filled models. There isn't much of a difference between the 982 and 982M other than the damascening and printing on the back of the movement. I recently landed a nice Keith project watch. I knew it would need a new crystal but the seller's photos weren't very clear so I wasn't exactly sure what to expect overall. The 14K case back is unengraved and will polish up nicely, I bet. Without the crystal in the way, the dial is in great shape and appears to be original. This 982M dates to 1950, just as it should, and it's very dirty. It will definitely benefit from a trip to the spa. There are no watchmaker's service marks inside the case back. Sort of makes me wonder if I'm the first person to touch this movement since it left the factory in Lancaster PA. I wonder what the staining inside the case is from? The mainspring inside the movement is definitely set. A new mainspring will give this watch 40+ hours of run time. A new glass crystal will make a huge improvement in the watch's appearance. Everything is cleaned and dried. The staining inside the case back is gone now. Check out the difference in shape of a fresh Dynavar mainspring. This will be make a huge difference in the energy of the watch. The watch is now running nicely so it's off to the timer to see how it's performing. The performance looks great. its running a smidgen fast but that's easily corrected by a minor tweak of the regulator. A genuine croc strap is an excellent choice for a solid gold watch and I really like the dark brown color. The freshly polished case looks much different now, don't you think? I have the Keith my father received on his 21st birthday in 1950. Could I talk to you about restoring it? You’re welcome to contact me by emai or via Etsy and include a photo.